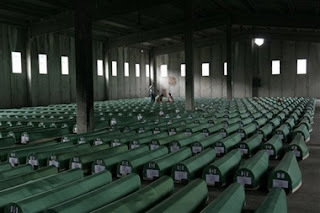 SARAJEVO (AFP) - Bosnia was to lay to rest on Wednesday the remains of more than 450 Muslims killed 12 years ago in Srebrenica, in Europe's worst massacre since World War II. Up to 30,000 Srebrenica survivors and victims' relatives were expected to attend a solemn religious ceremony and the funeral at the memorial cemetery where the remains of more than 2,400 of those killed are already buried. They will be joined by the UN chief war crimes prosecutor Carla Del Ponte, as well as 2,000 people who set off Sunday on a four-day symbolic march to the eastern town.Among the remains of 465 people to be buried on Wednesday, there were those of one 75-year-old woman, while all the other victims were males, aged between 13 and 77. They were retrieved from mass graves around the eastern town and later identified by DNA analysis. At the end of Bosnia's 1992-1995 war, Serb forces overran the then UN-protected enclave of Srebrenica, summarily killing some 8,000 Muslim men and boys. It is the only episode of Bosnia's bloody war that has been ruled a genocide by the UN war crimes tribunal and the International Court of Justice (ICJ), both based in The Hague. The ICJ ruling prompted some Muslim leaders to call for Srebrenica to be given a special status and put under state jurisdiction, fueling tensions in an already worsened political situation in the country. After the war Srebrenica remained in the Serb-controlled Republika Srpska, which along with the Muslim-Croat Federation makes up the two highly independent entities of Bosnia. Bosnian Serb wartime leader Radovan Karadzic and his military commander Ratko Mladic, the two people considered the most responsible for the massacre, remain at large. "I'm working to get Karadzic and Mladic. I still hope that I'll get them by the end of my mandate in December," U.N. Chief Prosecutor Carla del Ponte told a group of Srebrenica mothers, who accused her of not doing enough to apprehend the two men. Serbian President Boris Tadic said in a statement that his country, consistently accused by del Ponte of harboring Mladic, was committed to locate and arrest all war crimes indictees. "That is not just our international obligation, it is something we owe above all to ourselves and to our neighbors," Tadic said, paying respect to the Srebrenica victims. The pair face charges of genocide for atrocities committed during the war, which claimed up to 200,000 victims. Karadzic is believed to be hiding in Serb-controlled parts of Bosnia and Serbia, and Mladic is thought to have found refuge in Serbia.